Getting rid of strep throat is why you’re here. You may have thought you were only coming down with a common cold, but now you can’t swallow anything and you’re practically choking on your tonsils. Do you feel a fever? Are there red and white spots on your sore throat? These are the symptoms of strep throat, known by people who care as streptococcus, also known as strep a. There is such a thing as strep b. (Group B streptococcus, or simply GBS) that young children and pregnant women should be aware of because it can be passed from mother to child at birth and has caused the deaths of many infants–something that can be avoided if the mother is given strep antibiotics during labor. You shouldn’t have to worry, according to the Directors of Health Promotion and Education, most people carry strep b. bacteria without getting an infection, and it’s only when an immune system is weakened sufficiently that it becomes a problem. Chances are that you’re not suffering from strep b. but strep a., the more common of the two bacterial infections. This is what you should do to get rid of strep throat whenever it comes up. Aside from the usual cold and flu symptoms, if you notice symptoms of strep throat like red and white spots on your tonsils, a sore throat, difficulty swallowing or breathing, swollen tonsils, swollen lymph nodes, headaches, fever, loss of apetite, and nausea, it is a good idea to see your family pracitioner to get a strep test (strep culture) done to check for strep a and/or strep b. A doctor will prescribe you the antibiotics necessary to treat a strep infection. Really, the only sure way to get rid of a strep infection is to see a doctor, get a strep test (strep culture) done, and take antibiotics for about 10 days. Now, it’s important to remember that you complete the strep antibiotic treatment. If you don’t, the illness might make a comeback or even become rheumatic fever, and that my friends is a very bad thing to have. To prevent your friends and family from getting strep throat, keep things that go in your mouth away from them. It is strongly recommended that you keep an infected person’s dishes and eating utensils seperate from others’. Until the person with a strep infection has taken antibiotics, they are very contagious. You don’t have to lock them in their room and feed them by sliding a plate under the door, but you should be cautious. To prevent dehydration caused by strep throat, drink plenty of fluids. As with most other illnesses, dehydration is a concern when solid food doesn’t seem to want to stay down or can’t be swallowed. Drinking plenty of fluids that contain electrolytes (sports drinks like Gatorade) will help ensure that you or your child is staying properly hydrated. Hydration is key to a smooth recovery from a strep throat, and it feels good to swallow liquids especially if it’s cold. Eating plenty of soup will help you get rid of strep throat. A lot of people feel no desire to eat once they’ve contracted a strep infection. It’s important that you get something in your stomach, even if you’re about to swallow your tonsils. Try to find soups without a lot of sodium. Sodium, as we all know, is not good for you–and can contribute to dehydration. Feed yourself or your children “good” soup of you’re going to treat strep properly. Gargling with Salt Water is a popular strep throat treatment. Gargling with salt water to treat a strep throat works by a rather simple principle: salt draws water from the swollen cells that are causing you pain and the inability to swallow foods. Not only that, but brine kills bacteria, decreasing the chances of the infection spreading. That’s the theory anyway. I just think it feels good. I like to imagine that the burning sensation I get from gargling salt water is the death of those darned strep bacteria. Usually a doctor will prescribe one of a number of penicillin antibiotics to cure strep throat. Varieties of these types of antibiotics are amoxicillin, flucloxacillin, dicloxacillin, and methicillin, though there has been an increased number of cases where the strep a. bacteria are found to be immune to methicillin based antibiotics. Lately, Azithromycin, known as Zithromax commercially, has been gaining popularity as a strep infection treatment. Personally, I’m partial to three particular brands of antibiotics: Cefzil, Levaquin, and Vantin to help fight bacterial infections like strep throat and sinusitis. Green tea with honey is one of many natural remedies for strep throat and other respiratory illnesses. Studies done on Green Tea suggest that some of the chemical compounds present in it help to shorten the time it takes for a person to recover from an illness. We particularly enjoy Tazo Green Tea. Honey has also received thumbs up from similar studies. Slippery Elm Lozenges, are another good natural strep throat treatment. 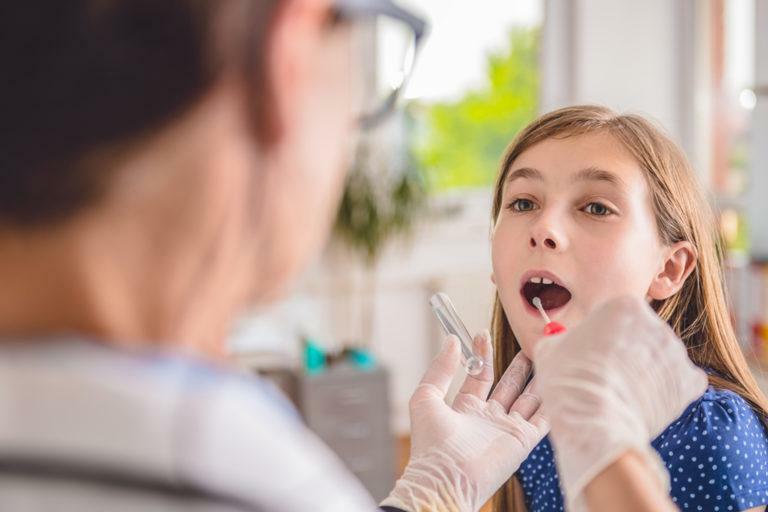 Nobody likes the pain and discomfort that accompanies a strep infection, and slippery elm throat lozenges help to alleviate some of that pain, naturally. Plus you can get Slippery Elm lozenges from Amazon. Eucalyptus Oil, as I’ve mentioned in an article on sore throats, is a natural microbe-killing agent. The effervescence, if I can use that word, of Eucalyptus oil is a great relief of, and distraction from, the associated pain and congestion of a strep infection. Not only that, but the anti-microbial qualities of Eucalyptus oil make it a good supplementary additive in a warm mist or vaporizing humidifier.